You could spend a lot of time perusing the resumes of identical twin brothers Kevin and Keith Konarska, who retire at the end of this month as Superintendent of Kent Intermediate School District and Grand Haven Area Public Schools, respectively. But on neither’s document will you discover a certain touchstone to their lives that helped both men attract legions of followers as they carved out their respective careers as highly respected educators. In short, they learned early the value of hard work, specifically as tenders to their father. A “tender,” in case you don’t know, qualifies as one of the toughest jobs you might ever have, as the grunt who mixes mortar and hauls bricks and cement blocks to masons. It usually involves not only heavy, thankless work – but being yelled at incessantly by men impatient for more material, men often perched high above on scaffolds, which makes the tenders’ jobs even more demanding and hazardous. I’ve known guys who worked less than one week as tenders before quitting to find more humane work, which, in essence, is just about any other job you might discover. But the Konarska brothers were different, and in plying those hardscrabble roles for their father back when they were making their way through high school and college, it helped both create a blueprint for success where nose-to-the-grindstone served as a mainstay. Maureen Slade was never aware of those past lives, but she’s not surprised: “Very hard workers,” says Slade, who spent 31 years as an educator in Grand Rapids and Kalamazoo, and now serves on the GR Board of Education. As an administrator for special education in GR years ago, Slade clearly remembers hiring both Konarskas, when they were starting out as speech pathologists. Born just 9 minutes apart (Kevin first) on August 11, 1957, the Konarskas are the only children of the late Melvin (who went by Pat) and Margaret (who went by Peg) Konarska, who raised their boys mostly in Flat Rock, MI.Because of her long association with both Konarskas, Slade is among a select few who have been able to track their career paths, which have been eerily identical on several fronts. Their passion grew to be the outdoors, and today, both are avid hunters and fishermen with an abiding love of nature and ecology – and sporting dogs. Working alongside their father helped them appreciate grueling hours at a back-breaking job, but also helped convince both to attend college. As youngsters, Mrs. Konarska tended to dress both her sons the same until they hit kindergarten, but didn’t take it much further than that. The boys do remember, though, their mother telling them how, at a young age, when one became injured while apart from the other, both would feel pain. And they engaged in the usual hijinx you might expect from identical twins, fooling classmates with their drop-dead identical countenances. Upon entering college, the Konarska twins converged on similar tracks, both signing up to become speech pathologists. Both graduated from Central Michigan University in 1980 with teaching degrees, and both then promptly earned master’s degrees from CMU, and later Grand Valley State University. Their professional lives mirrored each other over the next three-plus decades, as both worked in elementary and secondary buildings, then became administrators, though never at the same sites. Both made their mark in special and traditional education – mostly in Grand Rapids and neighboring districts — before assuming roles as assistant or deputy superintendents, and finally, superintendents. Both men married CMU grads, and in fact – without the other knowing – both became engaged to their future wives (who both worked as educators) on the same day. Their marriage dates are different, however, and while Kevin and his wife Laurie have two children in Patrick and Quinn, Keith and Patti have three children – Chelsea, Kaitlyn and Zachary. 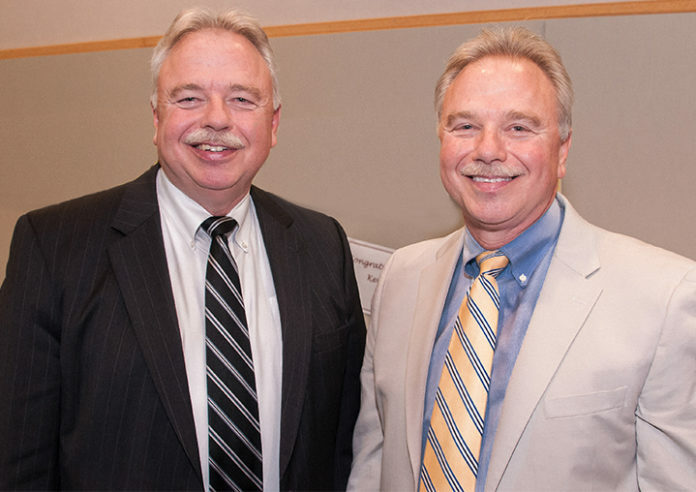 Over the years, Kevin and Keith continue to bear a striking resemblance so much so – right down to their identical moustaches — that on one occasion, Keith was visiting Kevin where Kevin was serving as principal at Lincoln School, and found himself separated from his brother and trying to convince staff members that he wasn’t Kevin. There have been other occasions as well –when the brothers were in the other’s district for a workshop for example – and attendees were blown away not only by how Keith and Kevin looked alike, but also shared voice inflections and mannerisms. To this day, Keith and Kevin stay close, communicating virtually daily with one another by phone or e-mail. That trend will continue in retirement on at least two fronts, as both will be working part-time for the same consulting firm, and both will continue to patronize the cottage the two families co-own on Beaver Island. To hear each look back on their careers is to run a tape recorder, for both men emphasize how grateful they were for the opportunity to not only lead, but serve children. “Despite all the challenges that go on in education, the decisions that I’ve made and the joy that I’ve felt and the satisfaction I’ve enjoyed has always been on how I’ve impacted kids,” says Kevin. Says Kevin of his 9 years at KISD, “I loved coming to work every day, always looking forward to another opportunity to make a difference and finding new ways to bring people together. I have far more pride in allowing staff to be successfull, to take ownership for the great work being done now, and knowing that you contributed in some small way. J. Michael Washburn isn’t surprised to know both Konarskas soared, something he enjoyed witnessing during his illustrious tenure in education, mostly notably as long-time superintendent of Forest Hills Public Schools, where Kevin was once employed under his tutelage. Both men have enjoyed retirement parties in advance of their last day, June 30. At each occasion, Kleenex was needed by more than a few to help work through the goodbyes. He paused for just a moment, and in the next breath, he was talking not just about his own career, but his and another’s.